Measure the greatest width, greatest length and maximum depth. To calculate the size of liner you need. Our box welded liners are the perfect solution for formal, ornamental, swimming or Koi ponds where the sides of the pond are vertical and the base flat. Every one of our box welded liners is prefabricated in our factory, to your bespoke requirements. Known as fish pond liners, box welded to individual shapes, this can be the perfect solution for your pond in your garden. Why should I choose a made to measure, bespoke liner? 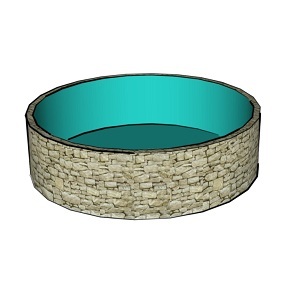 For formal ponds, either above or below ground, a tailor made pond liner will fit the exact dimensions of your pond. When the liner is delivered to you, you simply unfold it and slip it snugly into place, it’s very quick and easy to install. A simple fish pond liner alternative to the standard liner. Once in the pond, box welded liners do not have any unsightly folds or creases that need to be hidden like you would get if using a flat sheet liner. Box welded pond liners are also manufactured with a flange around the top that can be laid under paving flags to secure the top of the liner. All our tailored liners are made from 0.75mm or 1.00mm SealEco EPDM and heat welded (vulcanised) in our factory to ensure maximum strength and endurance of the liner. Are box welded liners suitable for Koi ponds? Yes! We have completed many Koi pond lining installations in the past (even with some Koi farms). Using a bespoke liner in a formal shaped pond provides the perfect habitat for Koi and other larger fish varieties because the whole area of the pond has a greater depth compared to a natural pond which will get shallower near the edges. The SealEco EPDM that we use for all our made to measure liners is certified non-toxic so will have no impact on any Koi, other aquatic life or plants you choose to put in your pond. It is also unaffected by UV, temperature fluctuations or frost so you can be safe in the knowledge that your liner won’t become brittle or crack. For more information regarding our koi ponds and fish pond liner solutions, submit an enquiry today or contact our knowledgeable team today on:01225 810 324. We have been fabricating box welded liners for over 50 years, and have done everything from simple circular or rectangular shapes right up to ponds with multiple steps, varying wall angles and separate sections. In order to supply the best liner for you, every liner is tailored to fit your requirements. For simple shapes, you can provide the measurements for the length, width and depth required. For more complicated designs a drawing or template may be required to ensure the liner is customised to fit. 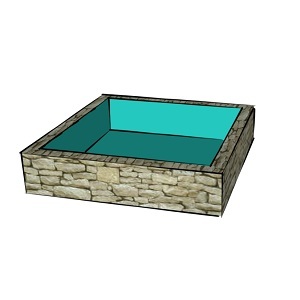 Where you have multiple connected formal ponds or rills we can supply each section as a separate box liner that would be joined together on site. To get the best out of your bespoke liner, we would recommend that all pond or lake liners are installed with a good quality pond underlay to provide protection from stones and roots. We supply in both 200gsm and 300gsm. Box welded liners do cost more than a flat sheet liner because they take additional fabricating time to weld the joints, but they are not as expensive as you might think. As an example, we have shown an indicative price for SealEco 0.75mm EPDM for a square and circular box welded liner (including a 150mm flange). All our liners are sent out with full installation instructions. You can also find guides to building and installing your liner in our Help & Guides: How To section. For larger projects, we can provide assistance with installation if required. This can either be undertaken by us or one of our partners. For more information, please see our Pond Liner Installations section or contact us.